The Mages Guild, also known as the Guild of Mages, was a professional organization, once located throughout Tamriel, that was dedicated to the study and application of magicka and alchemy. The Mages Guild was led by an Arch-Mage, and guided by the Council of Mages, made up of six Archmagisters (one of them the Arch-Mage). By the Third Era, the Arch-Mage and the Council of Mages were headquartered at the guild's Arcane University in the Imperial City. The Council decided important Guild policies, such as its policy on the use of Necromancy and also administered recruitment, sale of spells in each local Guild Hall, and the enforcement of Guild law. The rules of the Guild varied from location to location, some differences more drastic than others. In addition, Guild Halls existed in most cities in Tamriel, each of which was run by a local Guild Magister (alternatively known as a Hall Magister). Below him were the Master of Incunabula (alternatively called the High Incunabulist) and the Master at Arms. The Master of Incunabula had a counsel of two, the Master of Academia and the Master of the Scrye. The Master at Arms also had a counsel, the Master of Initiates and the Palatinus (the leader of the local chapter of the Order of the Lamp). Its charter from the Emperor specified that the guild must provide magic services to the public. Anyone could purchase potions, alchemical ingredients, magical items, and a selection of standard spells from the guild. However, training, goods, and services were cheaper for members, and the guild stewards were sometimes able to provide members with work. Furthermore, exclusive services such as spellmaking and enchanting, deemed potentially dangerous to the public at large, were only made available to higher-ranked guild members in good standing. 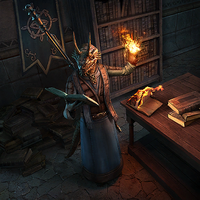 The Mages Guild was founded by Vanus Galerion in the early years of the Second Era as a way of centralizing magic and thus moving away from the many separate groups (like the Psijic Order of which Galerion was a member) that had dominated the study of magic until that time. In fact, the Psijic Order had already been falling out of grace with society. Its policy of isolationism led to mistrust, and its religion (best described as a type of ancestor worship) was an increasingly unfashionable philosophy by the Second Era. With the formation of the Mages Guild, Galerion spread knowledge of the magical arts to the layman, selling magical items, potions, and scrolls to the general populace. As such, magic was no longer restricted to the aristocracy or intelligentsia. The idea of Mages, Sorcerers, and assorted Mystics pooling their resources for the purpose of research and public charity was a revolutionary concept in the early Second Era. Galerion sought to prove the benefit of spellcasters working in close proximity, not for a mighty ritual, but for study, experimentation, and a sense of camaraderie. Thus, Galerion received the animosity of all. Operating out of Firsthold, Galerion was brought before his former mentor, Iachesis, the King of Firsthold, Rilis XII, and other notable nobles and members of the Psijic Order in the "Charter Conclave" of 2E 230 to state the intentions of the fraternity he was forming. This meeting was the consequence of a fearful commonfolk, who had urged their king to settle the issue of "Galerion's Folly" (as it was known at the time). Kinlord Rilis instead saw in it a way to play both sides against each other. While Galerion's speech was not recorded for posterity (creating much scholarly interest into what lies and persuasions Galerion must have used), the charter was approved. Some posit that Rilis approved the charter merely to further his own ends, but can be considered a sort of co-founder to the Mages Guild, despite his later pacts with Daedra and sadistic tendencies. Before his cruelty became well-known, the common folk would believe that the Kinlord had made a deal with "dangerous mages", a misconception the Guild hastily sought to rectify. The Guild Act of 2E 231 further confirmed the Mages Guild and sanctioned its presence within the Second Empire. Immediately following the formation of the Guild, the question of security had to be addressed. Initially hiring guards, Galerion realized what the Tamrielic nobility had known for centuries; that money alone did not buy loyalty. To this end, Galerion formed the knightly Order of the Lamp. In the following years, the Mages Guild grew across the Summerset Isle and gradually set foot in mainland Tamriel. Many superstitious and fearful rulers outlawed the Guild from their lands, but their descendants soon realized the benefits of allowing the Guild free reign in their territory. The Mages Guild had grown to be a powerful force within Tamriel, a dangerous foe if a somewhat disinterested ally. While the Mages Guild strove to maintain its neutrality in political conflicts, on rare occasions its participation has been the ultimate decider. While the Guild maintained a strict hierarchy, many knew it to be nothing but a chimera. To this end, its founder, Vanus Galerion, left the guild in disgust, stating that it had become "...nothing more than an intricate morass of political infighting." Despite this, Galerion still held the venerable title of Archmagister Emeritus, and influenced many of the Guild's affairs. Eventually, the Mages Guild established its headquarters within the Arcane University in the Imperial City, signing a charter that further defined its rules and abilities. 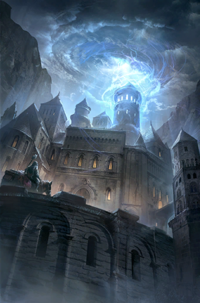 The Arcane University would eventually become the foremost magical research center in Tamriel, replacing the Crystal Tower of Summerset Isle. Following the Soulburst in 2E 578, the Mages Guild briefly had its charter revoked, and was replaced by the Fellowship of Anchorites. In 2E 582, the exiled Mages Guild re-established a central headquarters on the isle of Eyevea. In the same year, the Mages Guild played a critical part during Molag Bal's attempted invasion of Tamriel. After a conference between the opposing leaders of the Alliance War, it was decided that a small force of Mages and Fighters Guild members would venture into Coldharbour to defeat the Daedric plot. Successful, Tamriel was saved from destruction. The guild would eventually reoccupy the Arcane University within the Imperial City. Sometime later, Vanus Galerion would confront the lich Mannimarco, his once childhood friend and orchestrator of the Planemeld, in a mountain pass with Mages Guild fighters and the Lamp Knights. By the end of the battle, Mannimarco was thought to be defeated, but Varus Galerion, the Guild's venerated founder, would eventually die. At least by the late Third Era, the Mage's Guild maintained close relations with the Shadow Legion, which was composed of Imperial Battlemages who guarded the Arcane University. In 3E 431, narrowly-elected Arch-Mage Hannibal Traven made numerous policy changes, tightening admission to the Arcane University and banning the practice of Necromancy from the Mages Guild. Consequently, a severe split emerged within the Guild. Half the Council of Mages resigned, and Magister Ulliceta gra-Kogg of Orsinium was forced to flee for her adherence to necromancy. Technically speaking, the original ban on necromancy enacted in the Second Era was still active. However, several Archmagisters had been content to ignore it, while some reputedly practiced it in secret. As a result of Traven's enforcement of the ban, the only members on the Council were Caranya, Irlav Jarol and Council Steward Raminus Polus. In 3E 433, Mannimarco, the King of Worms, returned to Tamriel, attracting recruits alienated by the Guilds ban on necromancy to join his Order of the Black Worm. Mannimarco's mages attacked the Guild, even managing to burn down the Bruma Guild Hall. Traven sought the help of the Champion of Cyrodiil, and ultimately sacrificed himself to save both the Guild and Tamriel, designating the Champion as his successor. After the Oblivion Crisis, the Mages Guild was dissolved due to strong anti-magic sentiment of having started the Oblivion Crisis. The two splinter organizations were known as the Synod and the College of Whispers. Many of the greatest mages graduated from the Mages Guild. This was partly due to the Guild's prominence in Tamriel and open-ended recruitment policy. The Mages Guild encouraged all mages of varying skill and interest to join, and promoted an active regimen of practicing ones chosen spells to gain mastery over their specific school of magic. The Mages Guild taught its students to use magic in various ways, from Conjuration of Elemental Daedra, to Alchemy, to Dark Magic. After several centuries, this aggregation of magical research and knowledge became haphazard and disorganized, and a new model based off the Shad Astula Academy's curricula was proposed by Gabrielle Benele around the time of the Three Banners War. While the specific schools changed over the centuries, seven major schools of spell-casting and two other schools of arcane arts were taught extensively by the Mages Guild, providing students with a better structure to learn the concepts of wizardry in half the time of the old curricula. Alteration spells alter the physical and magical properties of the target, making objects heavier or lighter, granting elemental and physical shields, bestowing the ability to breath under and walk on water, and opening locks. Conjuration spells call upon otherworldy entities through telepathy, and certain skilled Conjuration mages can develop telepathic links with each other. Conjuration spells augment the caster by granting them Daedric and Undead guardians, Daedric weapons and armor, and the ability to repel the undead. Illusion spells affect light and a sentient target's mind. They can harm the target by commanding, demoralizing, paralyzing, silencing, and causing it to frenzy, or augmenting it by rallying, charming, calming it, granting it invisibility, night-vision, translucency and illuminating it. Mysticism is an obscure school, though its spells seem to manipulate magicka itself. With spells that bind the target's soul, this school is closely related to necromancy. Spells can augment the target by granting it the ability to detect life, reflect damage, absorb and reflect spells or harm it by dispelling its magical effects and trapping its soul. Spells can also move objects through space with telekinesis. The nature of the School of Mysticism is the subject of much scholarly debate. Restoration spells augment the target by restoring its health, attributes, stamina, and magicka, fortifying its health, attributes, skills, stamina, and magicka, granting it resistances to the elements, magic, disease, paralysis, poison, and un-enchanted weapons, curing it of disease, poison and paralysis or harm the target by absorbing its health, magicka, stamina, attributes and skills. Thaumaturgy does not change the appearance or structure of a force or object, but can manipulate laws temporarily. This allows thaumaturges to perform acts which can only be achieved through brute force in other schools of magic, such as levitation, etherealness, detection, pacification, water walking, teleportation, summoning and the manipulation of other magical forces. Alchemy is the act of mixing, boiling and distilling various substances to obtain their chemo-magical properties and create potions and poisons. Enchanting is the act of endowing objects with magical properties through the use of a soul, almost always with the use of a soul gem. The effects of enchanted apparel may augment the wearer, and the effects of enchanted weapons may harm the target. In the Second Era, Galerion banned the usage of Necromancy within the Mages Guild, and found the concept of soul trapping equally detestable. Due to the readily available presence of soul gems in nearly every bazaar of Tamriel, Galerion grudgingly co-opted the practice in an effort to control its use. Since the art was not a part of the core curriculum of the Guild, being taught only to the most experienced and dependable wizards for specific uses, Galerion codified and systemized the various practices of soul-trapping magics into a grimoire of a few, certain spells to be taught to students. Souls were classified into two classes; the legal, "White" souls were comprised of smaller essences from beasts or animals; the illegal, "Black" souls were derived from sentient mortals. Furthermore, the Guild outlawed "beastfolk magic", a type of wild hedge-wizardry commonly practiced by the Reachmen. For game-specific information, see the Arena, Daggerfall, Morrowind, Shadowkey, Oblivion, and ESO articles. ^ a b Events of Online. ^ a b Events of Oblivion. This page was last modified on 14 November 2018, at 12:26.